Ian McEwan writes about his relationship with Ian Hamilton in Another Rounds at the Pillars, and the text of McEwan's essay is available online at the Ian Hamilton Website. "A professional man of letters -- critic, editor, biographer -- though never a professional poet, Ian Hamilton (1938-2001) referred to his poems as 'miraculous lyrical arrivals', and he bided their time with exemplary patience and humility. His widely praised first collection, The Visit, published by Faber in 1970, was incorporated into Fifty Poems in 1988, itself expanded to Sixty Poems in 1998. In a preface to the former collection, he wrote: 'Fifty poems in twenty-five years: not much to show for half a lifetime, you might think. And in certain moods, I would agree.' Readers of Hamilton's condensed and immaculate oeuvre have felt otherwise: the poems of his youth and middle years (there was to be no opportunity for a late flowering) acquired talismanic significance for his contemporaries, and their combination of terseness and emotional intensity continues to set an example to younger poets. 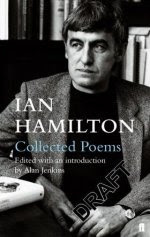 Edited by Alan Jenkins, this authoritative Collected Poems contains all of the poetry that Ian Hamilton chose to publish, together with a small number of uncollected and unpublished poems; it also supplies an illuminating introduction, and succinctly helpful apparatus. The result is an edition whose thoroughness and tact are themselves a moving tribute, restoring to view one of the most disinctive bodies of work in twentieth-century English poetry." Purchase from Faber & Faber.